This post is a result of a request from a friend who has great taste in posters. I have a feeling this friend also has an abundance of garlic scapes lurking in her fridge. Honestly, I don’t remember the amounts. This is really more of a technique. You can adjust the amounts according to your taste. I think this pesto would be great as a bruschetta. If you have too much pesto, you can freeze whatever you won’t eat that day. 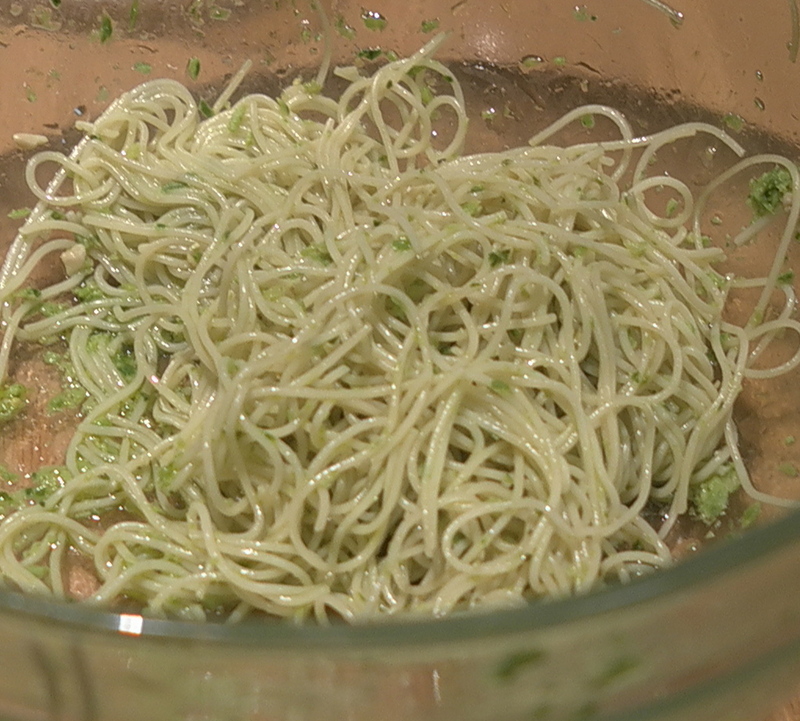 I used a few tablespoons of it with some angel hair pasta and a bit of the pasta’s cooking sauce. I froze the rest in ice cube trays for future meals. Thanks for the inspiration, omnonnombk! Using a food processor, blend together the first 4 ingredients until well combined, scraping the sides as needed. Add the parmesan cheese and process again until blended together. Use the small hole in the food processor to slowly add olive oil while the blender is going. You’ll need to scrape down the sides a few times. Looks delicious! I have yet to receive garlic scapes in my box but when I do I would love to make a pesto. Seems like a great idea.